I’m in love with the shape of you. We push and pull like a magnet do. I am so so excited to grace you with photos of one of the best people in my life, my BFF, Booskie! Booskie asked me out on a date and who says no to a date with a gazelle so I immediately said YASSS and naturally offered to style her dinner date outfit for the night. I had quite the time picking her outfit through navabi's ultra helpful suggestions according to body shape on their website. Booskie is currently a strawberry shape with a wider upper body and slender legs. All of navabi's selections for a strawberry body shape made sense and I could not help but pick this cool, statement outfit with stunning, eye-catching pops of color. For sizing details on Booskie's outfit, I ordered Booskie's true size for the T-shirt and jersey pants and I ordered a size down for a closer fit on her new coat. I create opportunities to dress-up so you know your girl had to show-up and show-out as well! 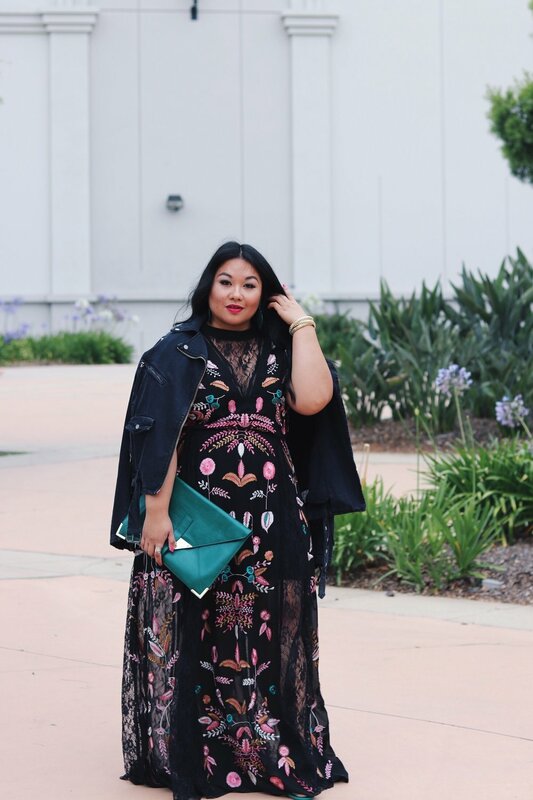 With a slender upper body and wide hips and some junk in the trunk, I shopped the pear shape selections on navabi's website and literally drooled over this embroidered-to-the-gods maxi gown. Check-out our personal thoughts on our dinner date outfits perfect for our body shape below. I always saw fashion as a way for others to represent me not as a way to represent myself. Being a T-shirt and jeans kind of girl was not just for comfort but simplicity. I loved this Zizzi feminist shirt on navabi and it added my favorite color to a T-shirt with a twist that is fun, bold, and classic. The ability to dress it up accentuating the bold or leaving it classic with jeans and some gold hoops, make this tee a must for me. The pants are amazing and that is an understatement. The fabric is sleek, smooth, breathable and comfortable, did I mention comfortable? Perfect way to switch the yoga pants for these to be worn for a night out on the town or any day of the week for work. I love that Gerry paired it with the graphic tee ( something I honestly never would of thought of doing). It allowed me to feel comfortable, stylish, and true to myself. Leaving the best for last, this coat! Being the girl who has nothing but black in her closet and leaves the fun colorful flair to home decor, stationary at work or accessories, I did not once think of wearing beautiful pops of color so jolly and vibrant that would make me feel just that. Jolly and vibrant! During our night out I got complimented twice on my outfit and for the first time In my life, I realized that my style is a representation of me rather than allowing it to be defined for me. P.S. And as if everything else wasn't enough, this adorable clutch put the icing on the cake. Count it on a dress with an abundance of panache to make you feel like a million bucks! Every. Dang. Time! Honestly, when I saw that this Lola Jade dress sold exlusively by navabi is a selection for my current body shape, I immediately praised Jesus because my prayers have been answered! I always dreamed of lace and embroidery together with dramatic lengths to skim the floor. This evening dress did not disappoint with its rich colors, detailed construction, and dramatic details. True to size, I could have easily ordered a size down but I was happy to stroll around Little Italy with a relaxed fit. I paired this number with my favorite green accessories and I am still swooning over the outcome. I absolutely loved being next to Booskie with this gown. I felt as if we were dressed to represent women and make curvy girls around the world proud. Black and pink was the color of the night and I felt as if we became symbols of strength, beauty, and progression all in one magical and delicious night. Booskie wined and dined me at the dope and delicious Cloak & Petal btw. How apropos with our outfits right? Shop by your body shape at navabi and explore which pieces compliment your perfect God-given shape! Also, navabi has a beneficial fashion advice page on their website that is worth surfing through. If you find something you can't live without, use code wearebebotxnavabi at check-out for 15% off. Now go spend some good girl time with your BFF and have fun getting dolled up! DISCLAIMER: I WAS PROVIDED WITH FREE PRODUCTs IN RETURN FOR A FEATURE POST HERE AT WE ARE BEBOT BLOG. ALL THOUGHTS AND OPINIONS EXPRESSED HERIN ARE MY OWN AND NOT INFLUENCED BY THE DEVELOPING COMPANY, AND/OR ITS AFFILIATES, IN ANY WAY.